Is Marco Creative Cuisine a deal you can’t refuse? It is a brave man who opens a different restaurant in a global mecca of consumption; shoppers have no patience for food that needs to be explained. Daren Leong is chef-owner of Marco Creative Cuisine in 1 Utama Shopping Centre. It is, he says, dedicated to modern gastronomy. He has reason to be optimistic, having tasted success with Miam Miam, a café-restaurant serving French-Japanese fare that was rebranded as ‘Franco’ in 2014. Leong did time in stock broking, banking and tech; he takes an empirical approach to his chosen vocation. His grandparents lived in a Fraser’s Hill bungalow. On their black-wood burning stove, they cooked roast turkey and roast pork, and baked Christmas pudding and mince pie for paying guests. He acknowledges the emotional connection, and then deconstructs it all in the name of progress and repeatability. I look for solutions, he tells Esquire, such as reducing the surface area of a piece of meat by neatly rolling it, Swiss-like, so that it absorbs less oil as it cooks. This way, the diner gets to savour the irreplaceable richness of the full-fat experience. It’s an instance of methodical precision enhancing the visceral experience in a world that suffers self-abnegation because of fake news (by food industry lobbyists). For Marco, named after the explorer and for his own son, he employed the tech model: menu development was akin to software development → prototype, test, deploy and refine. Recipes were open source and displayed for maximum visibility along the line → speed, consistency and quality control. All the better to make the real secret sauce behind every successful restaurant: service. Leong shows Esquire the customised app used in Marco that ensures each diner on every table is served the correct course, à la minute. It’s especially essential when you’re offering the hurried exec an exploratory, multiple-choice, four-course lunch. It dawned on Leong that food was also about systems engineering when he was delivering traditional Nyonya kuih in the darkest hours of night, working for his uncle. The Klang Valley was in the throes of its café culture years, and he had access to the inner sanctums. He then cut his teeth with a local kopitiam chain before extending his R&D with 11-hour shifts, six days a week in Singapore kitchens, working all stations. So, elbow grease x analogue know-how x big data → ? We’re seated at the back, away from the otherworldly jellyfish in the aquarium upfront. It’s early days for Marco, newly opened (and now into its second quarter of operations). Leong says every dish is sourced, prepped and cooked from scratch in-house, from stock-making to butchery. Here are Esquire’s soundbites on some of the items on the multicourse meal for RM78++(! ), as personally introduced to us by him, pending a sneaky revisit to update initial findings. Word on the grapevine shows Marco living up to its initial promise. Objective: Palate cleanser, to prep buds for meal. Description: Velvety matcha-lime foam covering a chilled lime snow. We’re apprehensive about combining acid and alkaline since they neutralise each other, but it works; the percentages are tastefully judged. Prudent matcha foam regulates the tart stimulus of citrus. Shooter glass novelty helps with customer acceptance. Objective: Alternative to bread; something more suited to the local clime and constitutions. 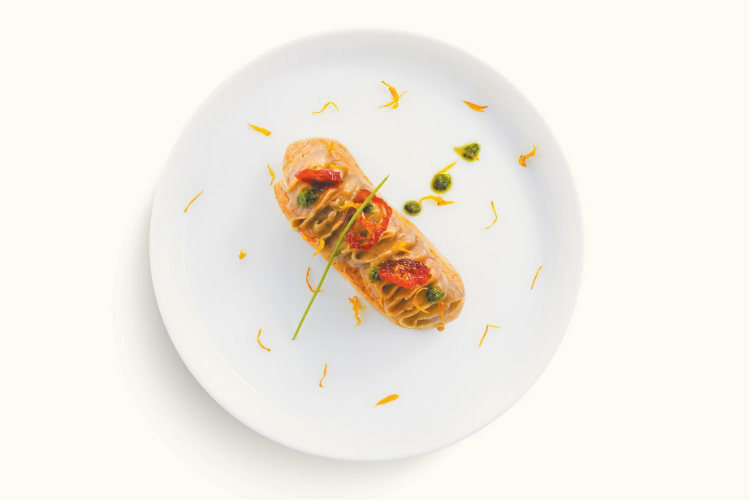 Description: Gruyère-flavoured petit choux decorated with aubergine caviar, spinach pesto and tomato confit. We’re not fans of the nightshade aubergine, but yeah baby, this controlled dose works for the mix of textures. The pesto and confit counterpoint each other like, hmm, fencers. Objective: Apéritif-like prelude to main course. Like the éclair, a soup suited to us, despite its seemingly foreign origin. 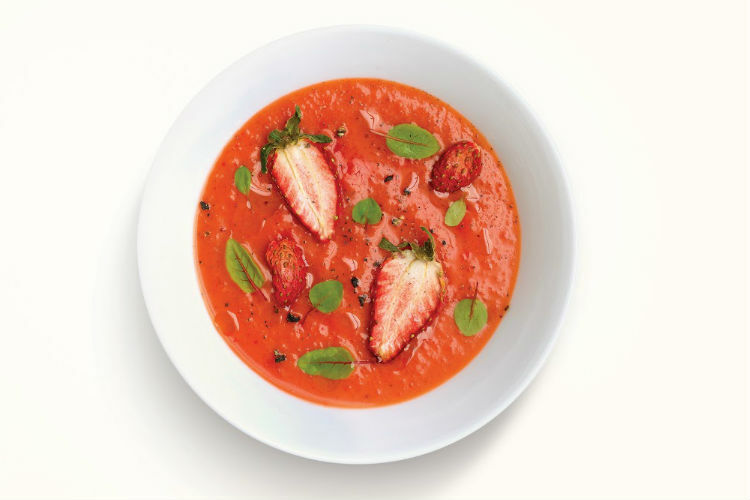 Description: Chilled cold soup of strawberries, garnished with dehydrated strawberries, capsicum and microgreens. Fresh and refreshing, just the thing on a hot afternoon. Serving temperature was ideal, not too chilled as to mute flavours and shut down the body’s enzymatic response. 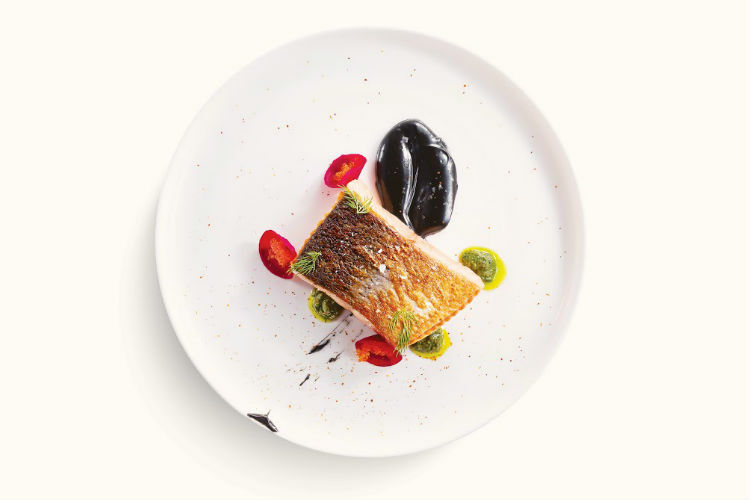 Description: Sous-vide Atlantic salmon with squid ink hollandaise, garnished with pickled beetroot and green chilli pesto. The sous-vide method must work, because the fish looked impeccable for the colour and the texture of its cooking consistency. The proof was in the cutting (and vicarious tasting). Marco Creative Cuisine, Ground Floor, 1 Utama Shopping Centre (Old Wing). Daily. Lunch service, noon to 3pm; dinner service, 6pm to 10.30pm; coffee and desserts only, 11am to noon, 3pm to 6pm. 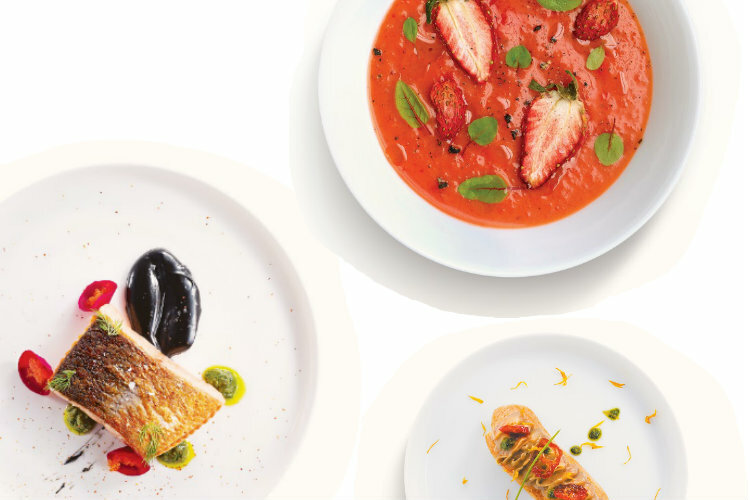 It has also introduced an a la carte menu.